at the Annual Patrons of Physics Fellows Dinner. The Patrons of Physics Fellows is a society created to recognize the generosity of those friends and alumni who make it possible for first-year graduate students to explore their dreams - to determine the right area of specialization, find a mentor, and have the freedom of time to develop new insights and ideas. MIT’s graduate program in physics is consistently recognized as one of the best in the world. We attract outstanding students with the discipline and creativity to make major contributions to our understanding of the universe and how it works. From string theory to high-temperature superconductivity, we are closing in on answers to some of the most fascinating problems that have been addressed. $70,000 for a one year expendable graduate fellowship. $250,000 to endow a partial fellowship (covering a half-year’s tuition for one student annually). $1 million to fully endow a graduate fellowship, includes annual tuition and stipend. This is a critical time to be sure we keep attracting the best minds in physics. Unfortunately, the cost of supporting graduate students has skyrocketed, in part because of the high cost of living in Cambridge. We face increasingly tough competition from other institutions for the best students. Our goal is to be able to offer every incoming graduate student a named fellowship. Those who commit $70,000 or more will become members of the Patrons of Physics Fellows Society, regardless of the type of gift - endowed, expendable or corporate. By joining the Patrons of Physics Fellows community, you will be providing the opportunity for a talented student to pursue the latest iconoclastic theory or explore untested techniques. Each member will receive periodic updates from the graduate student he or she is supporting, in addition to an invitation to the annual reception in celebration of the year’s accomplishments. 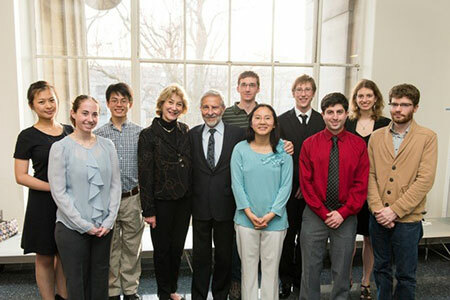 A gift to the Department of Physics is an opportunity for alumni and friends to play a vital role in the continued greatness of Physics at MIT. The gift of a graduate fellowship is truly a gift to current and future generations at MIT, and in a broader sense, to the world.